The Dallas Cowboys guard landed a six-year, $84 million deal, with $40 million guaranteed, to become the highest-paid player at the position in the NFL, additional proof of the increasing value teams are placing on guards. The importance of the quarterback and the NFL’s continued development as a passing league have funneled more money to those who protect the franchise player, but offensive tackles are no longer the only ones landing hefty contracts. 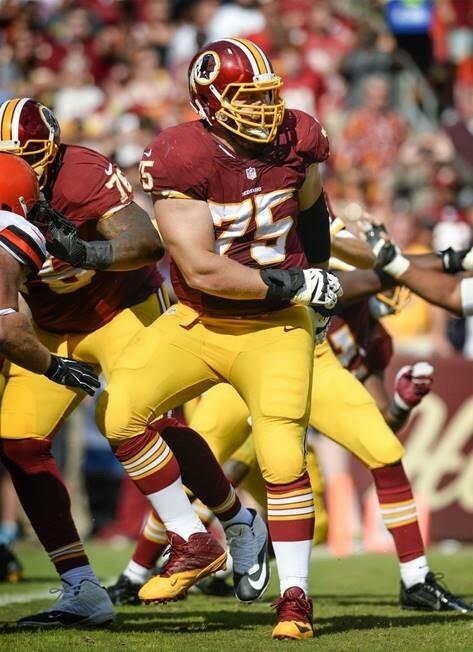 When tackles Trent Williams and Morgan Moses are healthy, the Redskins have one of the better offensive lines in the NFL, and they need it to protect the $94 million investment they just made in quarterback Alex Smith. There’s also new hope for a previously floundering running game with the addition of running back Derrius Guice and the development of Chris Thompson. Mike Reiss: What did you find most challenging about the transition from one sport to the other? Nate Ebner: "That's a big question. I grew up playing football. I didn't play in high school. But I've been around it; I watched it every day. It's part of our culture. I transitioned in college too; I was in my second year in college and I had three years of eligibility before the NFL when I walked on, so I had some time to do it at Ohio State. "That first year was actually a humbling experience, because I thought I would be able to go in and lean on my athletic ability a bit more. But learning the ins and outs and stuff that has to do with football -- offensive formations as a defensive player, and all the different packages, I could go on and on about that. It's basically a lot to learn. It was hard. You play rugby -- there are 15 guys on the field and you don't sub [out]. "I play rugby union, Jordan Mailata plays rugby league, and that's different. Rugby league is a different version of rugby. "But again, the transition for me was a humbling one. There's a lot to learn, but you just have to grind away at it. That's the biggest thing I can say. My biggest learning years were definitely my rookie year in the NFL. I played three years of college football and didn't really grasp it like I did in my rookie year. So to come straight into the NFL right away with no real experience, it's going to be challenging [for Mailata and Scotland-Williamson]. It's challenging enough as it is just to make it, for everyone, even if you grew up playing the sport your whole life." MR: What surprised you? Something maybe you didn't see coming? NE: "The amount of studying that you have to do. In rugby, and coming from all my experiences, we studied film a little bit but not to that extent; it's a game where you go out and practice. The amount of film study was a surprise, how much detail went into it. Knowing what I know now, I realized it's what you need to do to gain every edge you can on your opponent and totally understand situations. "Another surprise is that people who really understand football, it's almost like a second language. There's so much verbiage, and that verbiage changes from team to team and can even change from week to week within the same team. But there's definitely a football language out there that you have to learn and understand. That was news to me as well." MR: How much time did it take to adjust to the pace of the game? NE: "It felt fast at first, but that's because I didn't know what I was doing. If you do anything for the first time that requires speed, it's going to feel fast until you understand it. Until you get used to it, it feels like everything is flying. "The biggest thing I learned is that you can't have any false movement in the plays. In rugby, you can afford a couple wasted steps here and there. The game's constantly flowing, you don't really get a break, so people are tired. In football, you can't afford to be going the wrong direction or take false steps. No wasted movement -- that was new." MR: What skill sets from football lent themselves to rugby? NE: "That's such a tough thing to answer. For me going back to rugby like I did, I would say the biggest thing that helped was just the explosiveness and strength you gain training in football, and football made me a more explosive rugby player. It's a different ball, it's a different skill set, even the way you tackle and play defense can be different. People love to correlate the two because they're contact sports and you tackle, but they're also very different sports too. Man-to-man coverage is nothing like being in a ruck and vice versa, there are plenty of examples." MR: How challenging was the mental switch from one sport to the other? NE: "For me going from rugby to football -- I had a lot to learn. I couldn't just let the game flow and play because your footwork is important, your eye control is important, what you're thinking about in certain situations is important. 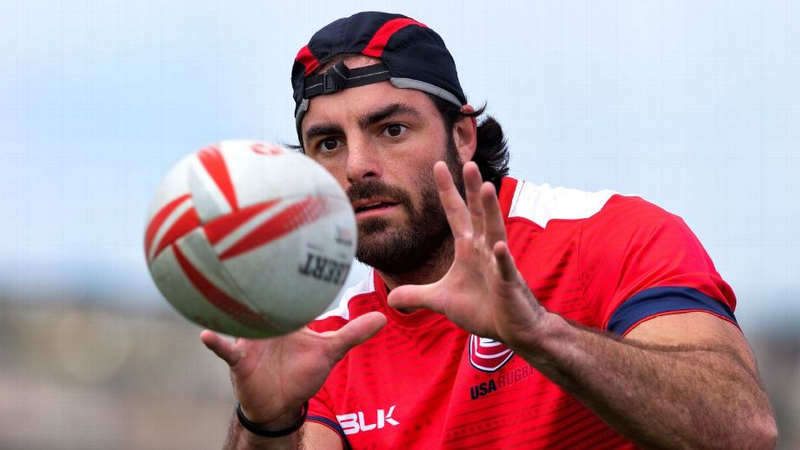 "I think the speed of playing in the NFL helped me slow the game of rugby down. But even with that, my first World Sevens Series event that I did in Singapore felt like the game speed was flying, compared to when I was in the  Olympics just a couple months later. So it still took some getting used to. "The hardest part for me going from football back to rugby wasn't mental, it was cardiovascular. Trying to transition from six years away from rugby and playing in the NFL where I get a break after six seconds of playing with all-out effort, to having to continually move -- tackle, pass, get up, run, ruck; all those things -- that cardio was a monster. 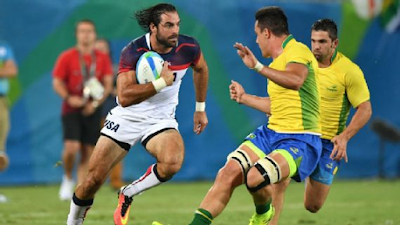 "It's unlike anything most football players have experienced, and would be a very different kind of challenge to do what those men do on the Sevens team day in and day out. Again, another part of the game that is very different." MR: How did a rugby tactics book compare with a playbook? NE: "This is another aspect of rugby that, to me, is more like basketball. Whatever you think of a basketball playbook, I'd say rugby is more similar to that. A football playbook is on a completely different level. "A lot of basketball is running down the court -- fast breaks, 3-on-2s, 2-on-1s, some double teams so try to find the open guy. Rugby is a lot like that -- quick turnover, fast break, we're going the other way; try to find the overlap, try to find the 3-on-2 or 2-on-1 situation. It's very similar in that regard. "Every once in a while you will have the set piece, like a half-court play, where you run a certain play and it's not an exact play where something specific has to happen. It's kind of like there are suggestions off this play, like a pick-and-roll [in basketball]. You can keep the ball, or shoot it, or hit the roll guy. You have to take what the defense gives you and rugby is the exact same as that." MR: How did you find the different shape of the balls? NE: "I grew up with a football and a rugby ball, sitting side by side. If you're an athlete, we do drills with tennis balls all the time, it doesn't matter -- the ball, you catch it." MR: How does the buzz of playing in the Olympics compare with playing in the NFL? NE: "To me, they're completely two different things. Playing in the NFL is a great experience, walking out to play in a Super Bowl, for a championship, that's what you do it for. It is the most-watched event in all of sports. It's amazing to be a part of, special in its own right. "But walking out with a United States badge on your chest and being on a completely different continent and walking out for the opening ceremonies and having a different country cheer for you because you're representing the United States -- and getting a chill because you know what you represent, what's on your chest and what you're there to do and how this thing is so much bigger than you -- that's an unmatched feeling in and of itself. They're both awesome." NE: "Professional sports require so much more than just athletic ability. There are going to be challenges along the way. Some people have a lot of potential. This kid [Mailata] is 6 feet 8 inches, 350 pounds and runs like a tight end. That's some God-gifted size and ability. Just look at his highlights. So he has a start right there. "But he's going to be competing with guys who are similar size and they know what they're doing. I think it's a hard transition. There is a lot to football. But it's doable. I've done it, others have done it. But it's hard, a lot of guys have failed, too. "It's challenging at the top of anything. You can talk about business, art, sports, etc. The best in the world are the best for a reason. So it's tough... but you can do it if you work hard enough." 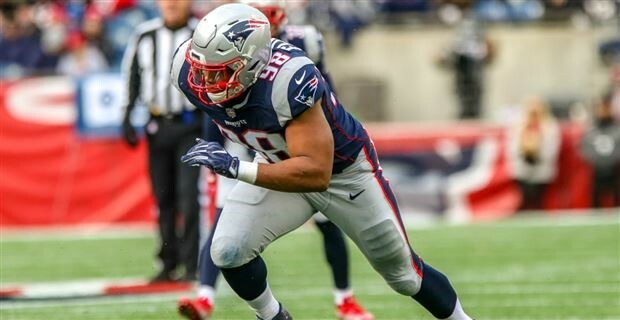 If he hadn't already, Trey Flowers looks like he's going to blossom in 2018. In a piece projecting various players throughout the league to make it to the Pro Bowl for the first time in their careers on NFL.com, former Cowboys VP and current senior NFL analyst Gil Brandt has tapped the Patriots defensive end as New England's candidate. Flowers has led the Patriots in sacks in each of the past two seasons (with 7.0 in 2016 and 6.5 last season), and he was one of just four Patriots to play every defensive snap in Super Bowl LII, which further shows you his value to this team. He has 34-inch arms and an 85-inch wingspan, two traits that are very helpful to a pass rusher. Statistically, Flowers hasn't put up the numbers of the elite pass rushers in the NFL, but he plays every bit the part of it within the Patriots' defense. The Arkansas product was drafted by New England back in the fourth round of the 2015 NFL Draft, but really didn't start making an impact until 2016 after dealing with a shoulder injury. Flowers wasn't kept a secret for long as he was able to make his presence known on the biggest stage during Super Bowl LI against the Falcons. The pass rusher was able to sack Matt Ryan on a critical second down with 3:55 to play to essentially keep New England's hopes of their historic 25-point comeback alive. For that game, he totaled 2.5 sacks and his rise to notoriety began, despite his somewhat underrated sack being overshadowed by Dont'a Hightower's strip sack of Ryan and Julian Edelman shoe-string catch. Flowers has been budding for quite some time, so he does seem like the right call by Brandt. And it couldn't be better timing as he's set to hit free agency this upcoming offseason. Another sleeper candidate could end being Chris Hogan given that he'll likely receive more looks from Tom Brady during the first quarter of the season with Julian Edelman suspended as well as the quarterback still works to build chemistry with his new pass catchers. 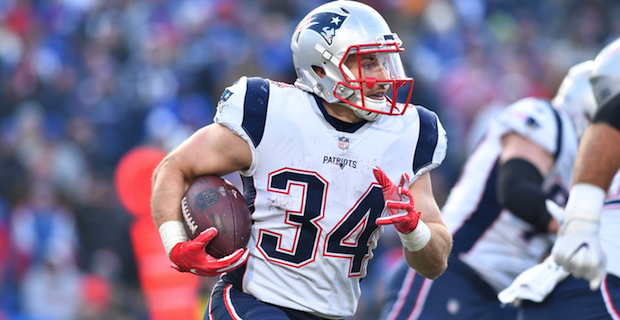 While he's been a clutch player for New England since arriving to Foxboro, Hogan could now be in position to put up the statistical numbers in 2018. It's certainly a long shot, but I wouldn't rule it out entirely. Speaking of Edelman, if he does lose his appeal of his four game PED suspension, then he would be ruled ineligible for that honor, per league rules. The rule states, "In addition to the suspension imposed on him, any Player suspended for a violation of the Policy will be ineligible for selection to the Pro Bowl, or to receive any other honors or awards from the League or Players Association, for the season in which the violation is upheld (i.e. following nay appeals) and in which the suspension is served." 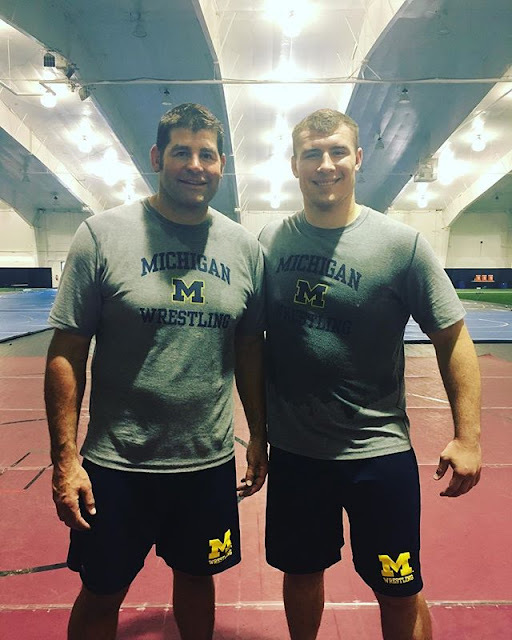 "2018 Michigan Heavyweight Camp brought in one of the best! Great working with Stephen Neal 2x NCAA Champ, '99 Freestyle World Champ and 3x Super Bowl Champ with the New England Patriots!" At the very least, football talking season will be here soon, as it’s only a month or so away now. Football talking season arrives when college football media days begin in mid July. This discourse is a lot more fun and interesting than your typical media day interviews, which are dominated by corporate cliches, mind-numbing pablum and worthless platitudes. When you talk shop on bodybuilding and weightlifting, you’re dealing with numbers, metrics, facts and figures, not coachspeak catch phrases that would fit only a motivational cat poster. 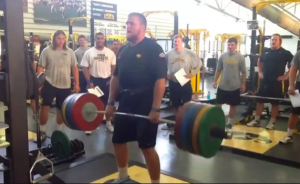 Lancaster did not get drafted by the NFL this past spring, but he was signed by the Green Bay Packers. Facing long odds, he will get his opportunity to make the squad when training camp opens up in July. Jamie Meder "one of the best run players in the NFL"
From Steve Doerschuk's "82 days before opener, Browns coaches say all systems go"
BEREA — In his spare time, Bob Wylie flies airplanes, performs magic tricks and plays musical instruments. Wylie’s full-time employer is looking for the magic that might make an 0-16 team fly out of an era whose theme song has been Boulevard of Broken Dreams. The Browns’ 67-year-old offensive line coach has a body-shape and bearing akin to Pop Fisher, the crusty manager from filmdom’s “The Natural,” who needed a miracle to revive his baseball team. Old Pop’s dreams came true when aging Roy Hobbs fell out of the sky doing a superb Babe Ruth impersonation. It’s the other way around for Wylie, who has lost aging Joe Thomas, the best player from the Browns’ expansion era. Yet, Wylie is optimistic he can get a left tackle ready in time to help the Browns do their take on coming out of nowhere. All around him, Wylie’s colleagues popped up with examples of why something amazing can be done. As a No. 1 overall pick from the 2017 draft, isn’t defensive end Myles Garrett supposed to be amazing? “If he stays healthy,” defensive coordinator Gregg Williams said, “watch out. Williams admits he loves Bradley Chubb, the defensive end half of Browns Nation seemed to want as the No. 4 overall pick. Williams laughs at Chubb’s “weakness” — he would have no chance trying to cover Antonio Brown. The Browns sorely needed a cover corner and spent the No. 4 on former Nordonia and Ohio State standout Denzel Ward. Williams raved at how quickly Ward endeared himself to Browns veterans with his attitude. His talent? “He’s one of the best press-cover guys I’ve seen at this level,” said Williams, who first worked in the NFL before Bill Belichick was hired to be coach of the Browns. Williams said holdover Emmanuel Ogbah is more than a consolation prize after passing on Chubb. Williams seems jazzed about so much of what might be in his second year as coordinator. 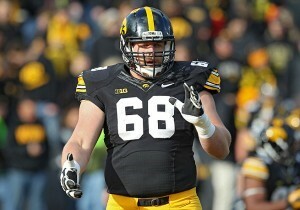 Safeties coach Jerod Kruse said he sees Peppers living up to his status as a Round 1 pick. Former Alabama quarterback Freddie Kitchens, the Browns’ new running backs coach, was hit by a vision in the final minicamp practice. It happened while running back Carlos Hyde was timing a run to explode through a crease at the exact right moment. 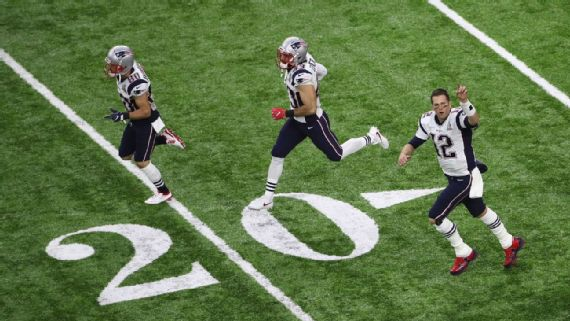 “The way he ran the ball there looked like the guy in Pittsburgh,” Kitchens said. “The guy in Pittsburgh” is Le’Veon Bell, a No. 48 overall draft pick out Michigan State in 2013 now regarded as one of the top three running backs in the league. Hyde was a No. 57 overall draft pick out of Ohio State in 2014 who started for the San Francisco 49ers. Kitchens, who spent recent years with Bruce Arians in Arizona, also has been handed rookie No. 35 overall draft pick Nick Chubb. Kitchens alluded to the fact Browns general manager John Dorsey has never been involved with drafting a running back as high as 35. Speedster Antonio Callaway is supposed to be a fourth-round steal if he can get past off-field issues. He has looked the part when he has practiced, coaches say. “The Callaway kid is stepping up,” said new special teams coordinator Amos Jones, eyeing the young wideout as a punt returner. Offensive coordinator Todd Haley suggested Tyrod Taylor is more than the latest starting quarterback. “Tyrod has done a tremendous, tremendous job establishing himself as the leader of this offense,” Haley said. “His car is in its parking spot every morning when I get here and it’s there when I’m leaving. Linebackers coach Blake Williams said he loves where his unit might be headed with Jamie Collins returning from injury and Mychal Kendricks signing on after starting for the Eagles in a Super Bowl win. Williams talked as if there is no odd man out, even though someone will have to be in terms of playing time. He said Kirksey is so good at pass coverage that there’s no sense in replacing him with a safety on some passing downs. “We’re really blessed with the linebacking corps,” Williams said. Can things actually turn quickly for the Browns? Last year was so bad. The tone among coaches coming out of minicamp was all good. Josh Cribbs, who is still strapping on the cleats to perform his new role as an intern return-game coach, sounded ready to pull on some boxing gloves. “I get offended when people talk bad about us,” Cribbs said. There was no chance of Cribbs being offended as long as he hung out in Berea on Thursday.